Messerschmitt Me 263 Video - From "Jet Aviation: History"
The Messerschmitt Me 263 was a rocket-powered fighter aircraft developed from the Me 163 Komet towards the end of World War II. Three prototypes were built but never flown under their own power as the rapidly deteriorating military situation in Germany prevented the completion of the test program. 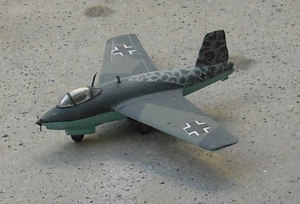 The Me 163B had two main shortcomings. One was a limited flight endurance; the second was the lack of a retractable landing gear, because it took off on a jettisonable two-wheel "dolly" that functioned as the main wheels of a conventional landing gear arrangement. The latter meant that the aircraft had to land on a retractable skid. Both shortcomings prevented it from becoming an efficient fighter aircraft. The Me 163C was an improved design with increased fuel tankage but still lacked retractable landing gear. The project was then handed over to Heinrich Hertel of the Junkers company. This resulted in the aircraft becoming the Junkers Ju 248. The design of the Ju 248/Me 263 started after the Me 163C because the Me 163C was not considered an adequate successor to the Me 163B because of its landing skid. The Ju 248/Me 263 took the wings and tail section of the Me 163B while the Me 163C was a completely new design. Already on 25 September 1944 a wooden mock-up was shown to the officials. The fuselage was considerably modified to accommodate larger fuel tanks to give longer range, the cockpit was redesigned for pressurization and fitted with a bubble canopy to improve the rear view for the pilot, and the landing skid was replaced with a retractable tricycle undercarriage. The Walter HWK 109-509 rocket engine considered for the design was re-designed in its 509B and C versions to have two chambers, oriented one above the other - a larger main chamber to provide power for takeoff and climb, and a smaller, auxiliary chamber, placed underneath the main unit, to provide lower thrust (and therefore lower fuel consumption) for cruising at altitude. The auxiliary chamber afforded a thrust of 300 kgf (660 lbf) which was in addition to the main chamber's normal thrust of 1,700 kgf (3,750 lbf), and the intention was that the aircraft should take off and climb to operational altitude with both rocket chambers operating at full thrust, then cut the main chamber and cruise on the power of the auxiliary chamber alone. This engine arrangement had previously been tested on modified Me 163Bs. The production version was intended to be powered by the more powerful BMW 708 rocket engine in place of the Walter power plant. Prior to the actual building of the Ju 248, two Me 163Bs, the V 13 and the V 18, were slated to be rebuilt. Unfortunately, the V 13 had deteriorated due to weather exposure, so only the V 18 was rebuilt. It is this aircraft that is often identified as the Me 163D. However, it should be made clear that there was no Me 163D, as this aircraft was built after the Ju 248 project had started. In November 1944, the aircraft was again redesignated as the Me 263 to show its connection with the Me 163. The two projects also got names - the Ju 248 Flunder (Flounder) and the Me 263 Scholle (Plaice). Hertel had hoped to install Lorin ramjet engines, but this technology was still far ahead of its time. As a stopgap measure, they decided to build the aircraft with a Sondergerx�t (special equipment) in the form of a Zusatztreibstoffbehx�lter (auxiliary fuel tank). This meant two 160 L (42.2 US gal) external T-Stoff oxidizer tanks were to be installed under the wings. This would lead to a 10% speed decrease but no negative flight characteristics. Although Junkers claimed the Ju 248 used a standard Me 163B wing, they decided to modify the wing to hold more C-Stoff fuel. This modification was carried out by the Puklitsch firm. In early 1945, Junkers proposed its own project, the EF 127 Walli rocket fighter, as a competitor to the Me 163C and Me 263. This was typical for the German war industry where companies still tried to outbid each other instead of focusing resources on a common project. First unpowered flight of the Me 263 V1 was in February 1945. Several more unpowered flights took place that month. The biggest problem had to do with the center of gravity which was restored with the addition of counterweights. Eventually, the production aircraft would have repositioned the engine or the landing gear installation to solve this problem. The landing gear was still non-retractable. The results of those first flights was the aircraft gave a "ziemlich fertigen Eindruck", meaning that it seemed to be ready. Test flights were later stopped because of fuel shortages for the Bf 110 towplanes. As the Me 263 was not a part of the Fx�hrernotprogramm (Fx�hrer's Emergency Programme), it was difficult to get the resources it needed. For the time being the plane was not expected to enter production but further development was allowed. The V2 and V3 were not yet ready. The V2 was to get the retractable landing gear and the V3 would have the armament built in. The next month both the V1 and the V2 had the two-chambered HWK 109-509C installed, correcting the center-of-gravity problems. They flew only as gliders.